Here in Kentucky, we love our college sports teams a lot. Our loyalties are pretty intense, and we never tire of finding new ways to rep our teams. 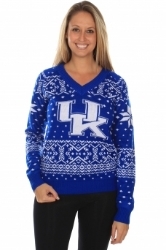 Here are the HerKentucky picks for the very best gifts for your favorite sports fan! Tervis Tumbler Water Bottle. I LOVE mine; I carry it everywhere. This UK Logo bottle will please any Wildcats fan! Kentucky Wildcats Business Card Holder by Louisville Stoneware. What a fun way to bring your team loyalty to the office with you! Contact Stoneware for customization options. Louisville Stoneware U of L Cardinals Salt and Pepper Shakers. The cutest Cardinals I've ever seen, and a perfect keepsake for your favorite Louisville fan. University of Kentucky needlepoint cufflinks by Smathers and Branson. So preppy and cute! Louisville Cardinals Women's Red Metallic Thread Scarf. Stay warm at the Belk Bowl! Clayton & Crume L1C4 keychain. This is simply adorable. Heavy canvas twill affixed to high quality leather and made right here in Louisville. For the ridiculous UK fan who has everything, how about a Rupp Arena replica dog bed? I can assure you that I'd be getting these for my own dogs if they made 'em big enough. Tickets to the UK - U of L Basketball Game. It's a long-shot, I know. The tickets are astronomical. But, something tells me that this game will be worth it. If you find any good leads, let me know. U of L Fingerless Gloves. How cute are these? A Trip to the Bahamas to watch WKU in the Popeyes Bahamas Bowl. If that isn't feasible, then how about the sweatshirt for the event? Clayton & Crume #BBN keychain. So nobody forgets you're part of Coach Cal's #lafamilia. Louisville Cardinals Needlepoint Flask from Smathers and Branson. The cutest way to sneak a nip. We're so excited to give away a few of these amazing presents to lucky HerKentucky readers. Clayton & Crume has provided us with a UK keychain and a U of L keychain, and Tipsy Elves sent us a ladies' sweater! Enter to win using the Rafflecopter widget below! Good luck, and Happy Holidays from HerKentucky!